It’s a dish that almost Franciscan in its austere simplicity, but you won’t be thinking about austerity while you’re enjoying filetti di baccalà. Far from it, the crusty batter fried in olive oil and the soft, savory fish inside are a sumptuous combination. Another excellent choice for Christmas Eve, as an alternative to capitone fritto, or Fried Eel. And as a fried dish, I’d think it would make a fine Hanukkah dish as well. At least 24 hours ahead of time, put the baccalà into a large basin with enough water to cover them amply. Change the water from time to time. About halfway through, when the baccalà is already pliable, cut it into long, slender fillets, perhaps about 7-8 cm/3 inches long and 4 cm/1-1/2 inches wide or so. This will speed up the process of softening and de-salting the fish (see Notes below). At least 2 hours ahead, whisk together in a large bowl the flour and enough mineral water so you have a smooth, silky, liquid but fairly thick batter (about the consistency of a pancake batter, if you’re familiar with that.) Let it rest until you’re ready to cook. Heat up a deep skillet with enough olive oil in to come up at least halfway up the side. Drain the salt cod fillets and pat them dry. Then, when the oil is hot enough, but not smoking hot. dip each fillet in the batter, then into the oil. Keep adding fillets but make sure not to crowd the skillet too much. Fry at a moderate heat, turning from time to time, until the fillets are golden brown on all sides. This should take about 10 minutes or so, but no more. As your fillets are done frying, drain them on paper towels or on a baking rack. Serve them as soon as they’re all done, with lemon wedges if you like, and a light sprinkling of salt. The pre-soaking time for the baccalà will depend on how heavily salted and how dry it is. Overnight soaking is a good rule of thumb, but older recipes often call for a full 48 hours of soaking. On the other hand, some salt cod sold these days is lightly salted and still fairly moist. This kind of baccalà needs only a few hours’ soak. Best of all, if you live near a major Little Italy, you may be able to find pre-soaked baccalà, which eliminates any doubts and saves you great time and effort. But before you start frying, do make sure that the baccalà has softened completely, since it will only undergo minimal cooking. And taste it to make sure it is not still too salty. If so, keep soaking. And keep the changing the water or the fish will stay salty. The ingredients that go into the batter can vary. This very basic one of just flour and water is the one they say is used at the iconic eponymous restaurant. Don’t be put off by its simplicity. It produces a light and crispy, very satisfying coating for your filetti. The mineral water and resting period produces a mild fermentation, which gives the batter flavor and some ‘lift’. The rest should last at least two hours, and some recipes allow for several hours. Some recipes call for a pinch of yeast or baking soda for extra ‘lift’ and a much shorter rest. For today’s post, I used half regular flour and half self-rising flour, and the results were quite fine. Be careful not to overdo, however, or your batter will be just too puffy. The same can be said about beaten egg whites, which some recipes call for. As for the liquid going into the batter, some recipes call for tap water, while others call for white wine or beer. Some recipes call for a drizzle of olive oil, and Ada Boni, whose Roman-ness is not subject to question, includes melted butter in her recipe for filetti di baccalà in Il Talismano. The ratio of liquid to flour requires some judgment. Too little liquid and the batter will just be too thick and ponderous; too much liquid and the batter will be thin, and might even slip off the fillets. Personally, I like a batter that covers the fish well and adds a nice crunchy crust, but without dominating the fish. If in doubt, best to try to batter and fry one fillet and see if you like the results, then add more flour and liquid if need be. And although you might be tempted, don’t season the batter. You should only salt your filetti di baccalà when you’re ready to serve. That way the batter will stay nice and crisp. The classic Roman accompaniment to filetti di baccalà are a kind of chicory called puntarelle with a garlic and anchovy dressing. Unfortunately, puntarelle are not to be found Stateside, as far as I know, but I’ve come up with a mock puntarelle recipe made with hearts of chicory which at least provides a hint of the original. Otherwise, a properly dressed green salad would do nicely. Or perhaps some French fries for an Italian version of fish and chips? But if you want to use another vegetable oil, you certainly wouldn’t be alone. Apparently the eponymous Roman restaurant uses vegetable oil—probably for economy. Canola oil is a practical if un-Italian choice, while sunflower oil is quite popular in Italy. And, as Ada Boni tells us in her recipe for filetti di baccalà, lard will work, too, odd as it may seem. Lard is marvelous as a frying fat. It is second to none for producing a crispy crust. If you ask me, lard is perhaps the best all-round fat for most frying, particularly if you enjoy its slightly “porky” flavor. The temperature of the oil needs to be just right. If the temperature is too low, you will wind up with soggy, greasy fillets. If it’s too high, you risk burning the outside of your filetti before the insides have fully cooked. You can judge the temperature by eye. You’ll see the oil moving and bubbling around your fillets in a lively but not violent fashion, as pictured above. If the oil should smoke, that’s a sure sign it’s overheated. If you want to be ‘scientific’ about it, you can use a special purpose thermometer. A good moderate frying temperature is 180C/350F, although if you use commercial olive oil you’ll need to go a little lower, as mentioned above, to avoid smoking. You need to give your fillets (or whatever you’re frying) room, so the oil will have a chance to envelop and sear the food you’re frying. Otherwise, your fillets will steam instead of frying. Proper spacing is also key to maintain the right temperature. If you crowd the pan, the temperature of the oil will drop precipitously, and that is not a good thing. But if the frying pan is too empty, the oil tends to overheat. And again, the photo above will illustrate what I mean. You should drain fried foods briefly before eating, either on a baking rack or on a plate lined with paper towels. This removes the excess fat and allows the super-hot fried fillets (or whatever you’ve fried) to cool off a bit. But then, just a bit. Fried foods are at their best when you eat them right away. As the Neapolitans say, frijenno manganno!—”fry it and eat it!” In a pinch, you can reheat fried foods, well spaced on a rack, on gentle heat in the oven for a few minutes, just long enough to heat them through. They won’t taste nearly as good as freshly fried, but it’s a practical approach to cooking for a crowd. At least 2 hours ahead, whisk together in a large bowl the flour and enough mineral water so you have a smooth, silky, liquid but fairly thick batter (about the consistency of a pancake batter, if you're familiar with that.) Let it rest until you're ready to cook. As your fillets are done frying, drain them on paper towels or on a baking rack. Serve them as soon as they're all done, with lemon wedges if you like, and a light sprinkling of salt. The classic condiment for this is skordalia (a paste made with EVOO/potato/garlic/vinegar or EVOO/bread/garlic/vinegar). How is this served in Italy? It would be great to see the differences and similarities. Thank you so much for the yummy recipe! Pinned immediately! Interesting! No, in Rome they’re eaten just as is, typically though accompanied by chicory dressed with anchovies, garlic, vinegar and olive oil, so yes,similar flavors. Another coincidence? My Grandfather insisted that baccala be served on Christmas Eve, although it was prepared in umido. Nonetheless, the fish will forever be connected to the holiday in my mind. The simplicity of your dish here speaks to me. It is one I am sure to try in the not so distant future. I hope the holidays were most memorable for you and your family, Frank, and wishing you nothing but the best in 2017! Thanks so much, John, and the same to you and yours! Good Lord, everything on your front page looks so delicious, I don’t know where to click first. But I chose this cod, because I’m always looking for good ways to cook fish. I’d like to eat more fish at home. And this cod recipe looks fantastic. Thanks! I would much prefer your fried cod to fried eel…it looks crispy and delicious. I hope you had a wonderful Christmas. Not a bad one, Karen. Hope you’re enjoying the holidays, too! I have never had this particular preparation for baccala but it sounds divine. Your detailed guidelines regarding frying is absolutely spot on. Interesting enough, I use the same type of batter when frying which I was introduced to while staying outside of Udine some years back. Thanks Paula! I’m sure this simple batter is pretty universal. And why not? It’s incredibly easy and tastes delicious, especially when frying in olive oil. Yes, I was always under the impression of the low smoking point of olive oil until we visited a farm in Castellina in Chianti where they grow and make very good oil as well as Cinta Cenese and all the wonderful things that come from that. The Lady of the house told me it was a myth and that she fried everything in their oil. I figured she ought to know! Well, the problem is—as the table you linked to shows—the smoking point of olive oil varies tremendously according to type and quality. The commercial olive oils most consumers will be able to afford does have a lower smoke point than some other oils. The kinds that have a higher smoke point can be quite expensive, especially here in North America, so it becomes truly extravagant to use for deep frying. That said, I do almost all my cooking with olive oil, including most frying, too. I just make sure the oil doesn’t get too hot and all is well. I think you need also to distinguish between shallow frying and deep frying. The former will rarely, if ever, need to be at the temperatures that the latter does. I will look forward to trying this, Frank. Baccalà isn’t easy to find in the desert. I found it once and it was really, really, really old and freezer burned. I will keep tying to find it so I can make this beautiful preparation. Buon Natale, my friend, and all the best for 2017! Good luck, David! Funny that they freeze baccalà out there, since it is already preserved through salting… but I guess the temperatures require it? We know exactly where Dar Filettaro is and it was on our to-do list last year and we walked past…but then there was a pizza place and it won…it won’t not next time due to this post! Your fish looks and sounds so good…I can hardly wait to try some. BTW, do you have any preference for the type of baccala you purchase and have you noticed any difference between what you get now and when you lived in Rome. Buon natale Frank e Felice anno nuovo…may 2017 be filled with much joy and many blessings. As mentioned in the post, I’ve noticed some baccalà you find is softer than others, and I like that kind rather better than the hard-as-a-rock variety. But since baccalà is often sold without labeling I couldn’t say much more or cite a particular brand. (Then there is stoccafisso, which is not salted but simply air-dried—but I haven’t tried it so can’t say if I’d like it more or less than baccalà.) As for differences with the baccalà in Italy vs North America, I don’t really perceive that much difference–for once! Perhaps because, as I understand it, most cod is fished out of the same source (ie, the North Atlantic). 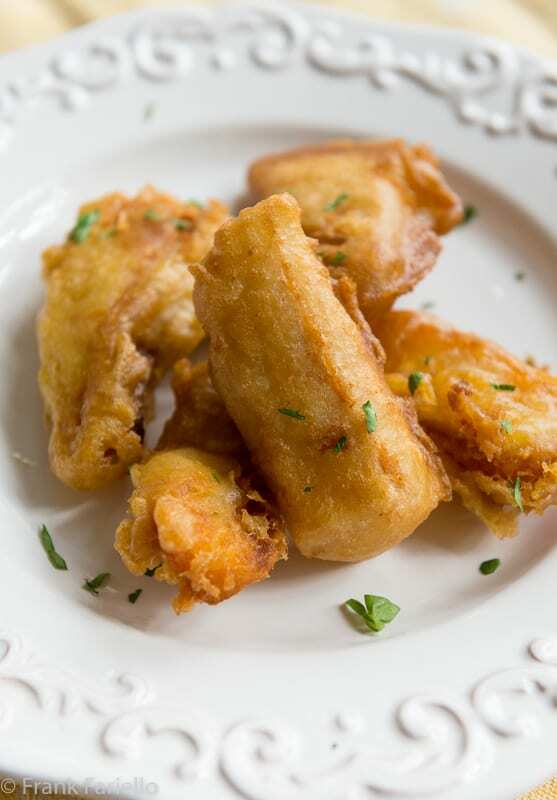 The Roman Jewish community certainly introduced many fried foods, and they certainly fried salt cod and other fish. Of course cod and other fish were as useful for Catholics due to fasting rules as they were to Jews who did not combine dairy and meat, but fish is considered “neutral”. https://www.walksofitaly.com/blog/food-and-wine/why-jewish-food-needs-to-be-on-your-list-of-what-to-eat-in-rome I’ve read most of the information summarised at this tour site in more serious (and lengthy) historical articles and books, though as a tour organiser, it no surprise that they are overly glowing about the uniformly high quality of food in the old Ghetto, which nowadays has many tourist traps, and still some gems. I’ve NEVER bought any produce or other food at Campo dei’ Fiori! But I was a graduate student in Rome, with a little scholarship… I ate very well, but we found cheaper places. Living in lake country, I do have a love of fried fish. I am loving the way that batter looks. So much so – I will borrow it for the lake fish. It’s hard to find baccala here – one place has it and it’s cost is the same as liquid gold! Merry Christmas, Frank to you and yours. I’m sure the batter would be wonderful with just about any kind of seafood, Claudia! Merry Christmas and a Happy New Year to you and yours too! Oh my, I wish I was sitting in Rom right now at your piazza enjoying a dish of baccalà. Happy Holidays to you and your family! Thank you, Gerlinde. Same to you and yours! Another happy customer of Dar Filletaro (it’s near the Santa Barbara church). Ordinary water does work, but the secret of a light crunchy batter is gassed water (or fizzy beer). My (McGee style) guess about the temperature is that the colder the water or beer is then the more it retains the dissolved gas, which disperses out when the coated fillet is immersed in the hot frying medium to create the bubbled structure of the cooked batter. This would also explain why you shouldn’t beat the batter too much as this will disperse some of the gas out of the batter. A couple of tips from UK fish and chips style frying: firstly, trad chip shops here often apply a light coat of rice flour to the fish before dipping in the batter as, supposedly, it helps the batter adhere to the fillet. The usual frying medium in former days was, and still is for perfectionists, beef dripping, which has a very high smoke point (at least 210C for the ultra refined type but some sources say up to 275C for less processed fat) and also has a much longer ‘frying life’ than other fats and oils. It is, however, a highly saturated fat and also, obviously, taboo for non-meat eaters. Like lard it imparts a very distinctive but not overwhelming additional flavour. I would be worried about using olive oil for deep frying as the smoke point is so low (quite close to ideal deep frying temperature – the frying medium must be hot to quickly seal the outside of the batter and trap the bubbles inside) and breakdown of oils begins before smoke point is reached (although it then proceeds rapidly at smoke point). 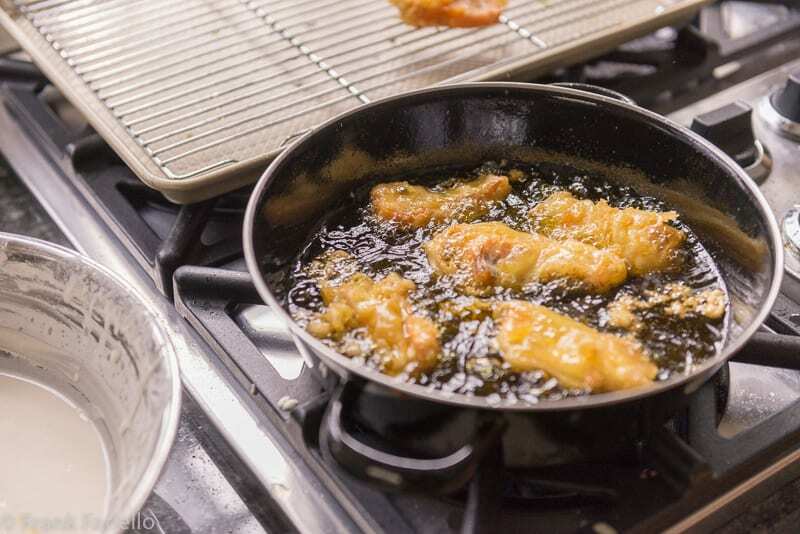 Refined sunflower or corn oils offer a good compromise with smoke points of 225-230C, well above the optimum temperatures for frying battered fish. And there never was a piece of fried fish that wasn’t improved by being served with chipped potatoes fried French style (a low initial frying at 130C and a second fry at a much higher temperature such as 180C). Thanks for the tips, Iain! We only had our baccalà all Veneziana, I’d love to try it this way. The batter looks so very light. Perhaps next year. Buone feste, Frank! Con questa ricetta è veramente Natale ! Buone Feste Frank, un abbraccio ! Grazie, cara, e buone feste anche a te! …. there is something to be said about deep fried fish… yum yum! … few nights ago I made some stuffed deep fried sardines… which, to me mind, confirms that deep frying is one of the best way of treating food – de-li-cious! + frank: living in campo dei fiori, merluzzo fritto, pizza bianca, puntarelle, carciofi!! …..what a life style! Buone feste, Cristina! E buon appetito! Looks delicious! I had a question about the temperature of the seltzer water. I have heard Italian cooks say that, when making a pastella, the liquid should be as cold as possible, “almost freezing”. You didn’t mention that aspect (unless I missed it). Do you have any insight on that? I’ve heard that advice about making tempura batter. They say it produces a particularly light and crispy crust. Never tried it in an Italian dish, though. I guess you’d need to give up the rest/fermentation? Would be interesting to hear what others think.I do like tempura a lot.